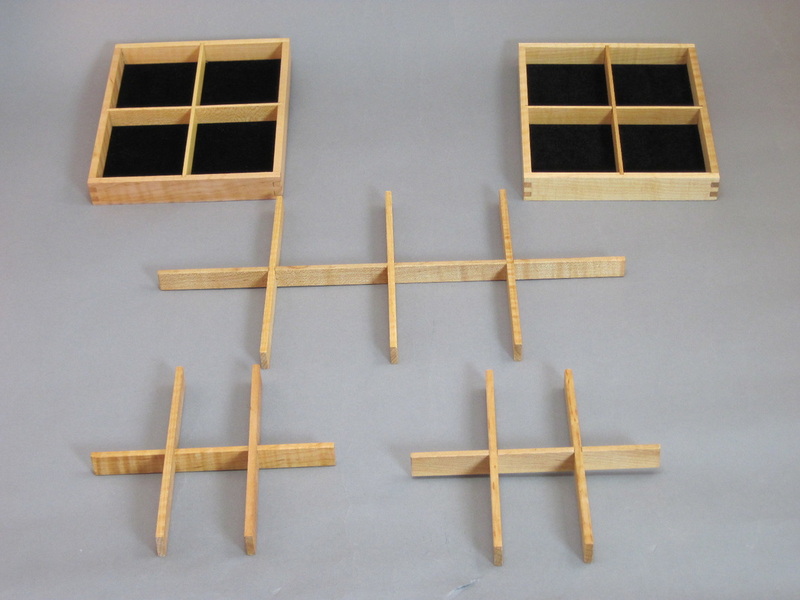 I have trays for my boxes in three basic sizes, as shown at below. At front right is the "standard" tray. This fits into the BX-06, BX-08, BX-07 and BX-17 boxes. 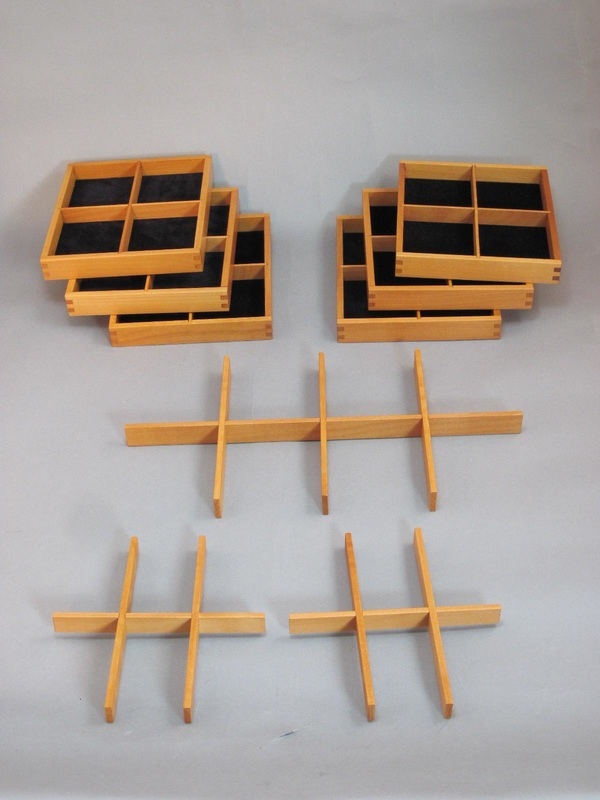 To the left of it is the "Large Tray", which fits the BX-16, BX-17, BX-18, BX-19, and BX-20. 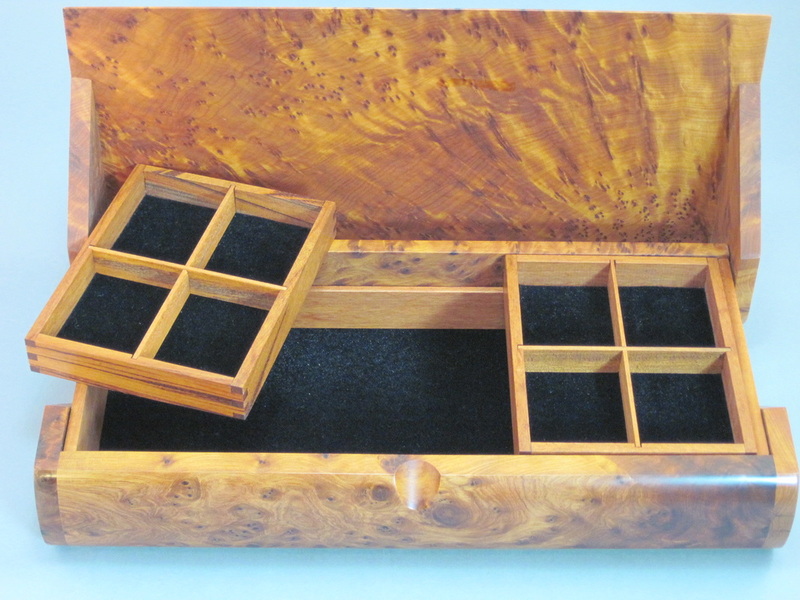 In back is the "Double Wide Pen Tray", which fits into the BX-18, BX-19, and BX-20. 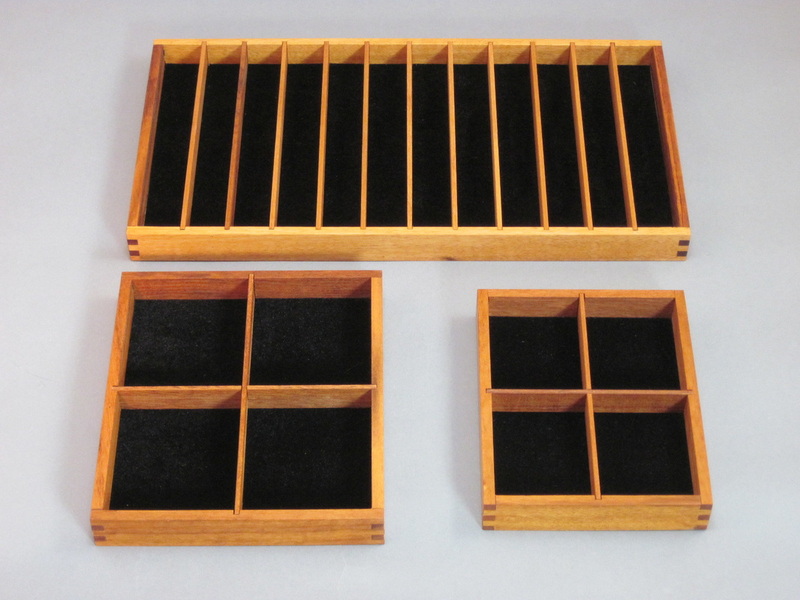 The price for each Standard or Large Tray is $25, the Double Wide Pen Tray is $75. Clockwise from front left, they are: Regular, Pen, Watch, and Cufflink/Earring. 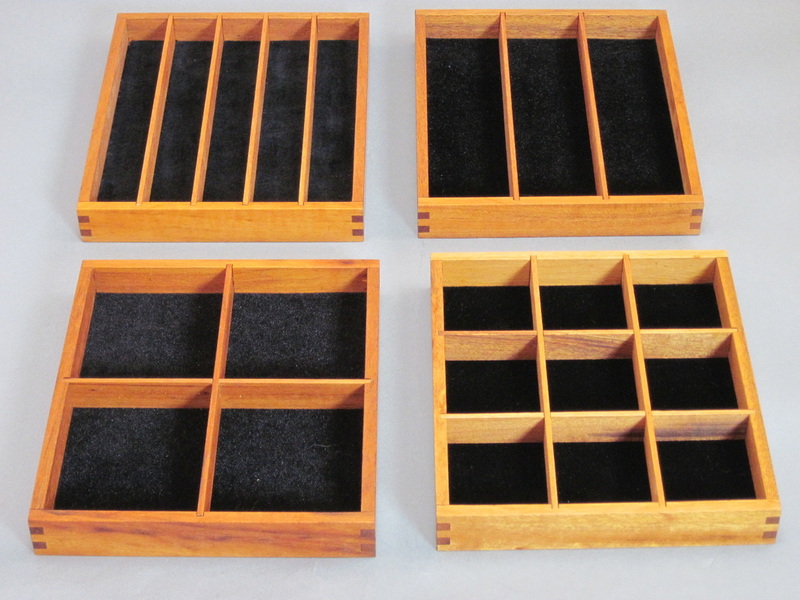 Any of these may be used in any box that holds Large Trays. 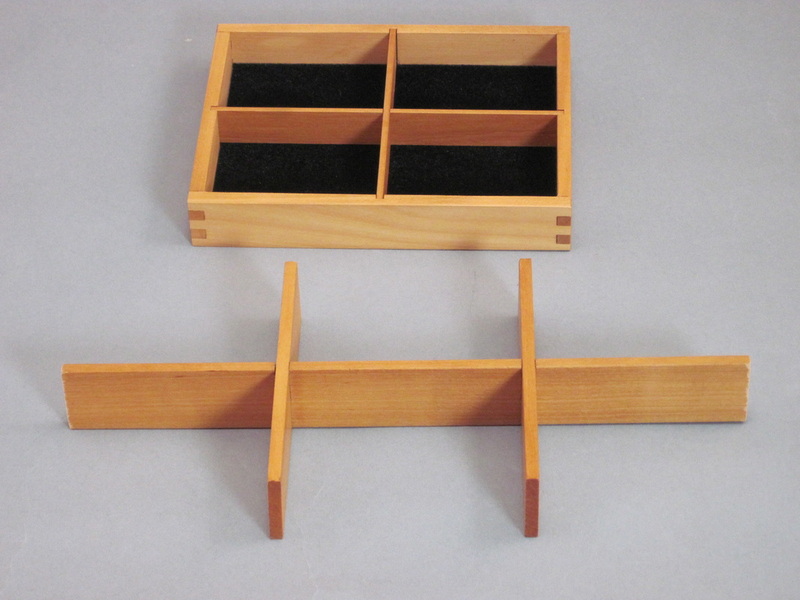 Standard configuration for the BX-08t is one Standard Tray and partitions, or rails (see bottom of this page). 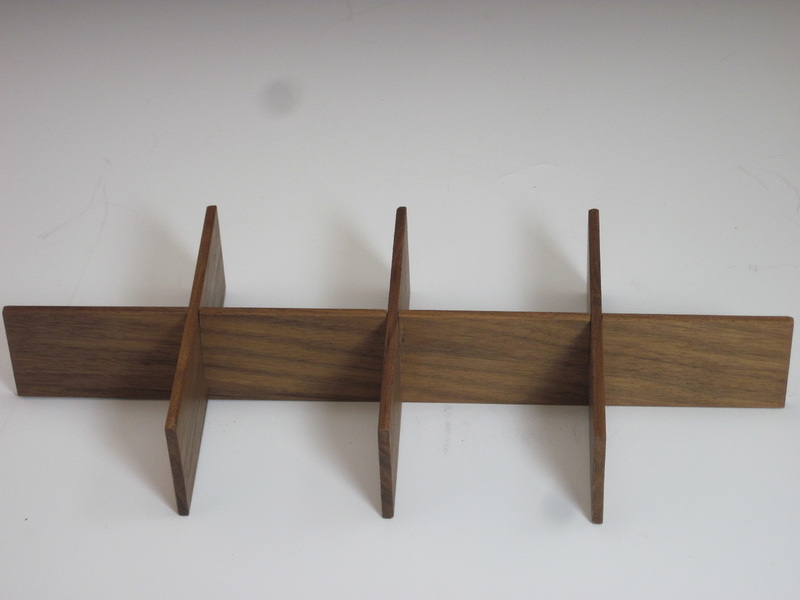 These partitions are about 8¼" long x 4¾" wide x 5/8" deep. 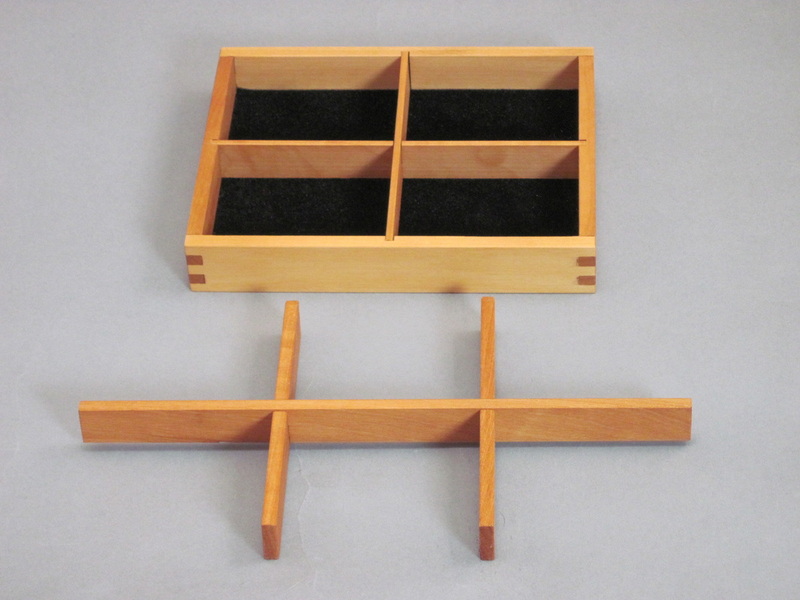 Standard configuration for the BX-07t is one Standard Tray and partitions or rails (see bottom of this page). 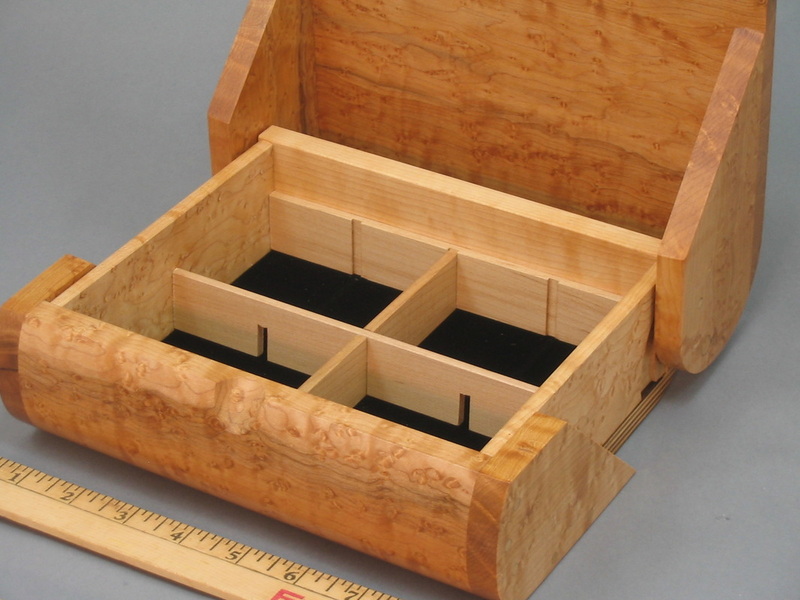 The partitions measure about 10¼" long x 4¾" wide x 1-1/8" deep. 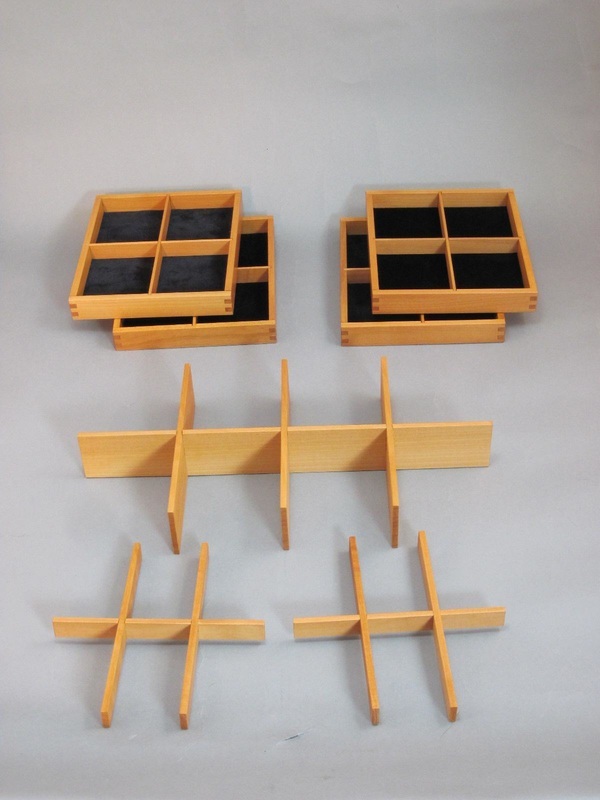 Standard configuration for the BX-16t is one Large Tray and partitions or rails, as above. 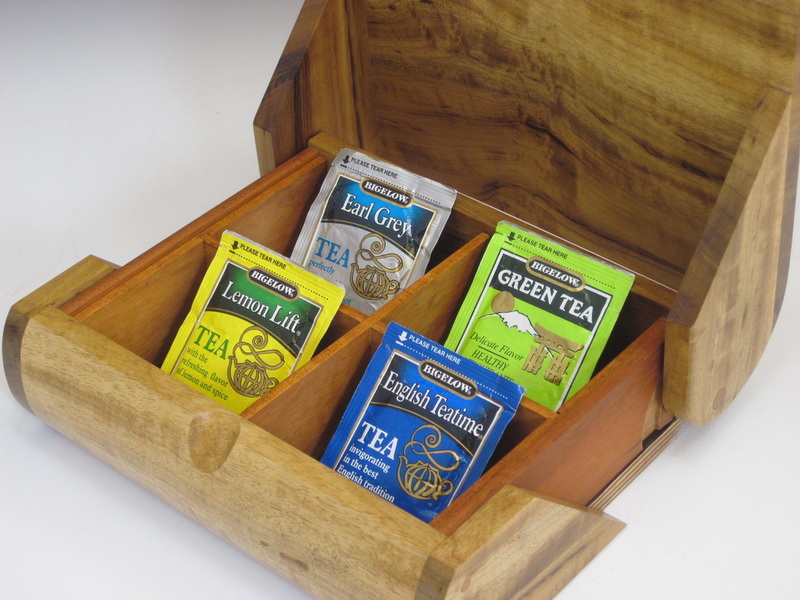 The BX-16 is also available as a tea box with 4 compartments. 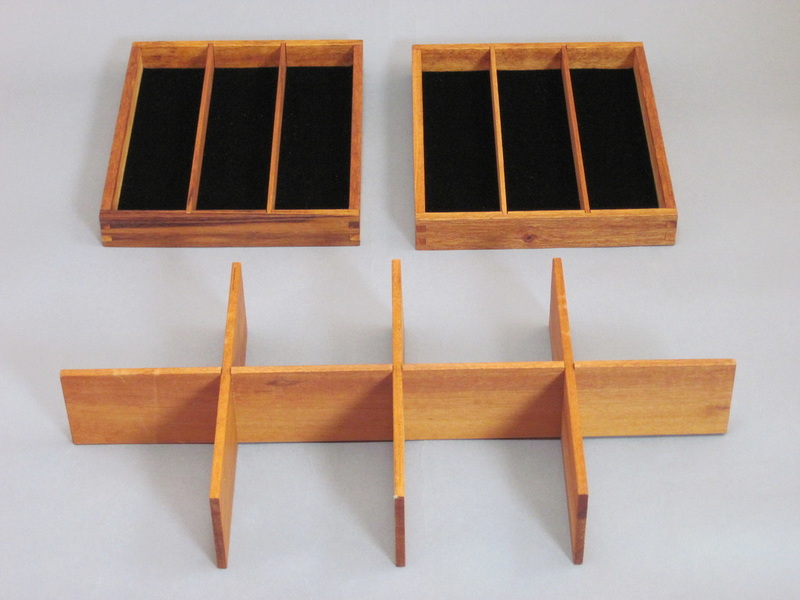 Standard configuration for the BX-17t is two Standard Trays and partitions or rails (see bottom of this page) . 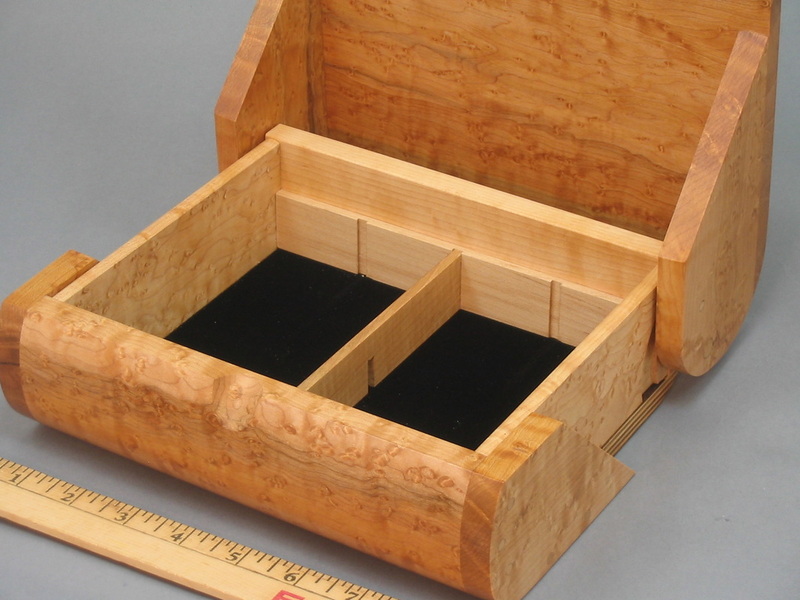 The partitions measure about 13¼" long x 6" wide x 1-1/8" deep. 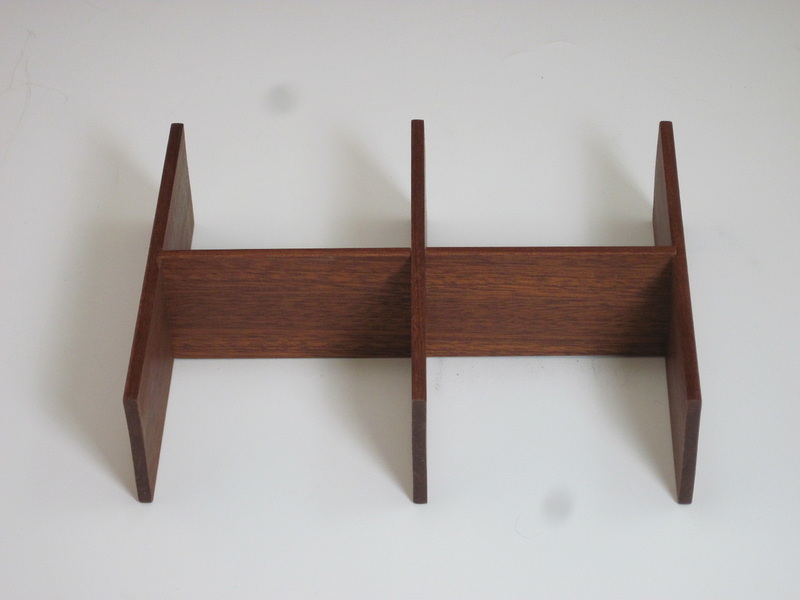 Note: the BX-17t is not wide enough to hold two Large Trays. 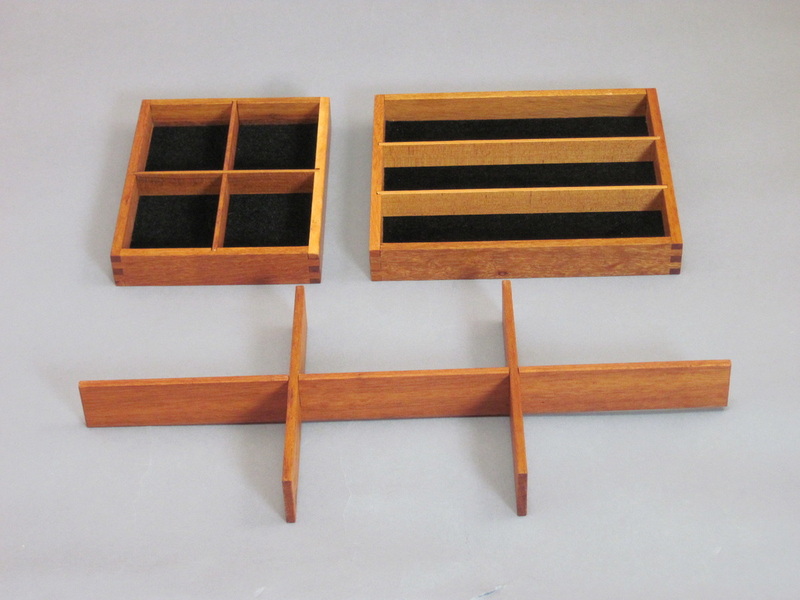 These partitions make the BX-17 a tea box with 8 compartments. Standard configuration for the BX-18ndt is two Large Trays and partitions or rails (see bottom of this page). 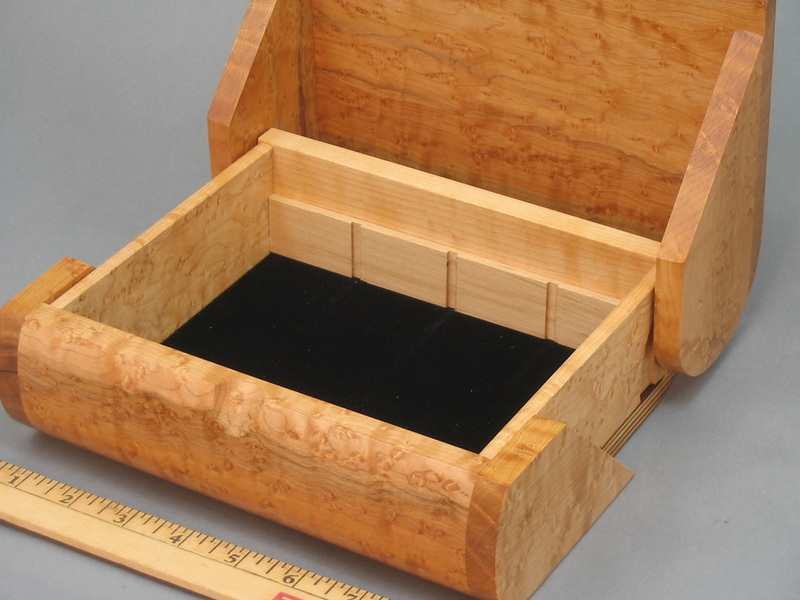 The partitions measure about 13¼" long x 7" wide x 1-7/8" deep. 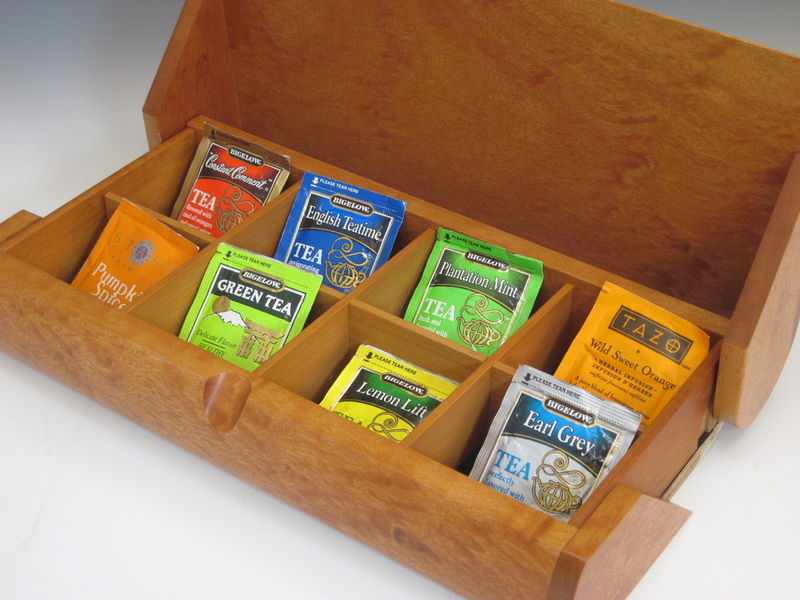 These partitions convert the BX-18ND into a tea box with 8 compartments. 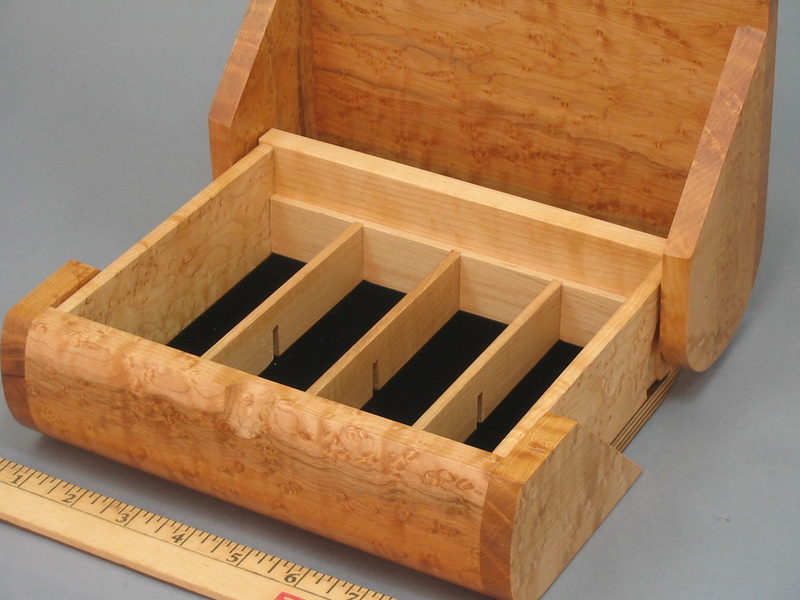 Standard configuration for the BX-18 is two Large Trays and partitions or rails (see bottom of this page) in the main compartment, the partitions measure about 13¼" long 7" wide x 5/8" deep, and two drawers with partitions 6" long x 6½" wide by 5/8" deep. Standard configuration for the BX-19 is two Large Trays and partitions or rails (see bottom of this page) in the main compartment. These partitions measure about 13¼" long 7" wide x 1-1/8" deep. There are two drawers, each with a Large Tray and partitions 6" long x 6¾" wide by 5/8" deep. 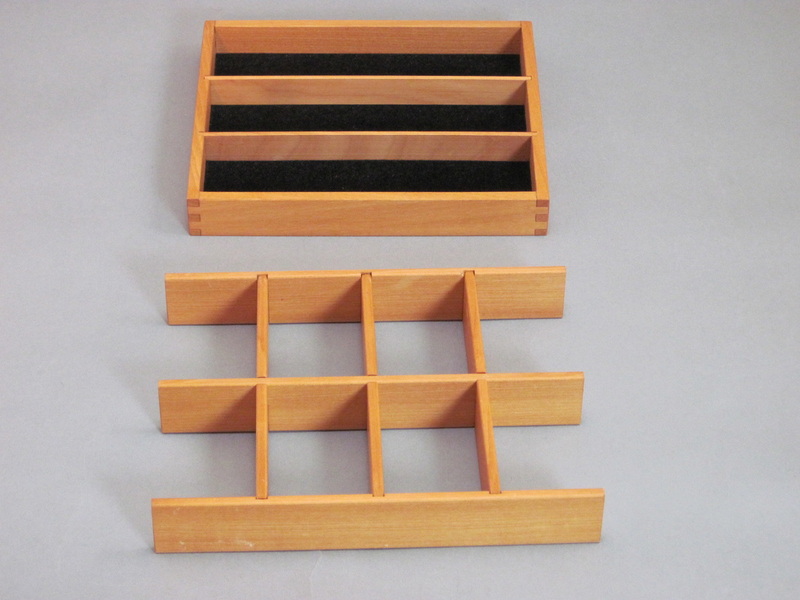 Standard configuration for the BX-20 is two Large Trays and partitions or rails in the main compartment, these partitions measure about 13¼" long 7" wide x 1-7/8" deep. There are two drawers, each with a Large Tray and partitions 6" long x 6¾" wide by 5/8" deep. An alternate configuration for the BX-20 has four Large Trays and partitions or rails in the main compartment, these partitions measure about 13¼" long 7" wide x 7/8" deep. There are two drawers, each with a Large Tray and partitions 6" long x 6¾" wide by 5/8" deep, as shown below. 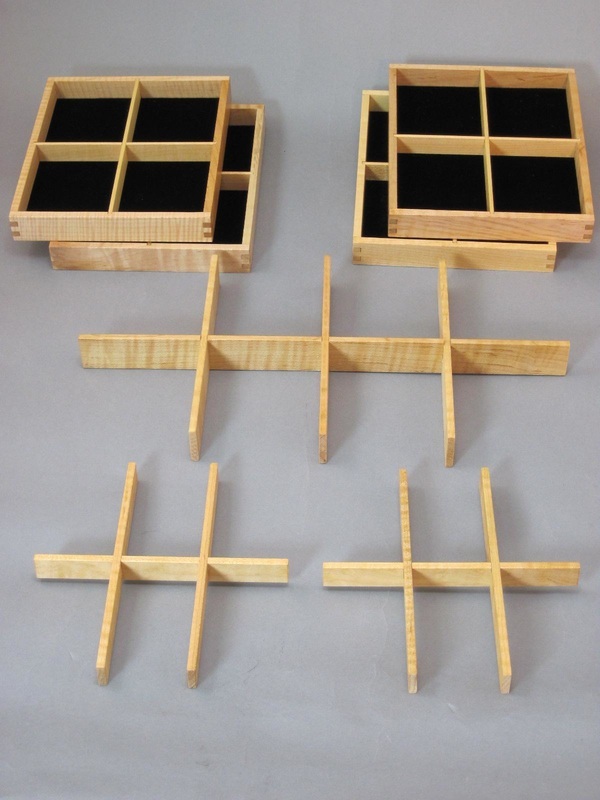 Any box with trays can be equipped with rails instead of partitions. This allows the box to have two levels, with one large open space beneath the tray(s). An example of rails in a BX-17t is shown above.